Today is the anniversary of the death of John Mathews, the first Borough Surveyor of Penzance. Less well known than many, it's fair to say that John Matthews left a bigger mark on Penzance than almost anyone else. 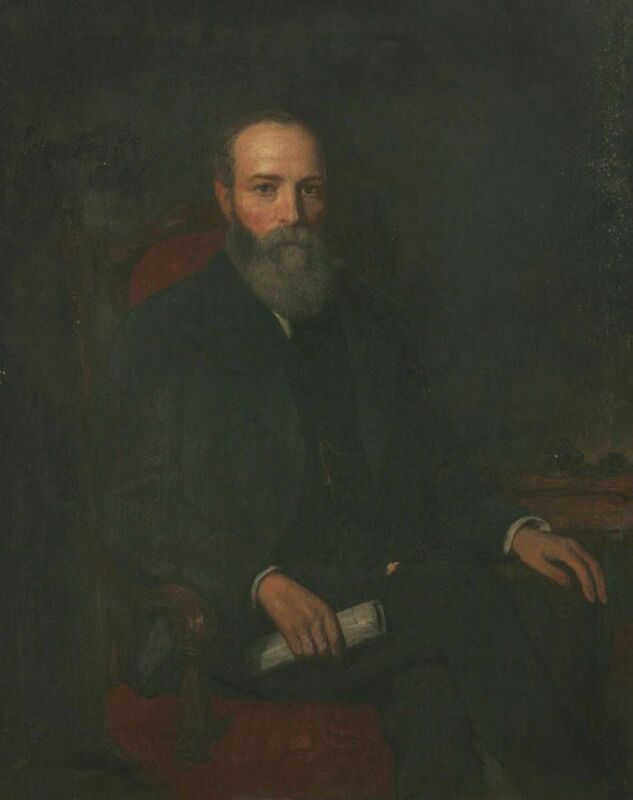 This portrait, held in Penlee House, is thought to be John Matthews, though there is no information to support this claim nor any information as to date of artist. John Matthews was born in Morvah in 1807, son of William Matthews, a farmer, who died when John was only five years old. The family went to live with his uncle at the Miners Arms in Morvah. On leaving school John served an apprenticeship as a carpenter with Mr Friggens in Madron. On completion of his apprenticeship he joined Mr John Crocker of Penzance, first as a foreman then as a partner becoming an architect and engineer. Precisely when John Matthews became Borough Surveyor is a little unclear. His obituary in the Cornish Telegraph of 19 November 1871 gives a date of 1844, when he would have been 37 years old but the Royal Cornwall Gazette of 25 August 1854 reports that the appointment was brought before the Council and agreed on 20 August 1854. Other sources suggest 1849. It seems likely that the formal appointment was as reported by the Gazette but that Matthews was already employed in a role with similar responsibilities. However, 1849 was certainly a big year in his career, it was the year of the Penzance Sanitary Report (see Penwith Papers) in which George Clark recommended significant work to remedy the town's poor conditions. By 5th October that year Matthews had prepared a new map of the town on which to base his plans for the new works and on 4 August 1852 it was decided that his plans for drainage and sewerage should be put on public exhibition in the Guildhall. John Matthews' work to bring the recommendations of George Clark's report to fruition had a lasting and beneficial effect on Penzance. As well as being Borough Surveyor Matthews also buttoned up his waistcoat over Inspector of Nuisances, Inspector of Lighting and Engineer and Clerk of Works. As well as the drains and sewers, in his time as Borough Surveyor John Matthews was responsible for the laying out and design of Princes Street Market, the Albert Pier works, he designed St John's Hall and also the Queens Hotel and was responsible for planning much of the towns road system. John Matthews was only 64 years old when he died in 1871, having retired through ill-health a couple of years earlier. He was buried on Saturday 25th November 1871 in the cemetery which he himself had designed. We had no efficient supply of water; we had no drainage; but the value of those aids to cleanliness and health was beginning to be appreciated by the public, and by no-one in this neighbourhood sooner than Mr Matthews. By him those beneficial schemes were carried out, and all the other great public works of the last quarter of a century…..Those works are patent to us all – our principal piers, our roads, all that is connected with our progress and development; and, last of all, the topstone of his achievements, the building in which we are now assembled – all were the work of the genius of late surveyor. Besides his legacy of improvements to the borough of Penzance John Matthews also left two sons who carried on his work, though not in Penzance. William was a civil engineer specialising in docks, harbours and other maritime structures. He worked across the Empire and his professional contribution was recognised when he was made President of the Institution of Civil Engineers. His brother John rose to the position of Engineer in Chief with Trinity House and was responsible for the design of a number of well-known lighthouses including Beachy Head, for which he also designed an aerial ropeway to provide access from the cliff, and, more locally, Pendeen Watch. Both brothers were knighted for their contribution to civil engineering. John Matthews, who spent his whole career in Penzance, is less well known than his sons but is perhaps the foundation upon which their distinction was established.